Is there any way to label the bottom of the graphic so that the numbered populations are more easily identified? The plot has no extra information that isn't in the table; I only post it because it gives a visual idea of the data. Ethiopians are 1.4% Han... lol. Is the 0.5% Yoruba in Spaniards noise? Does anybody know about its variability and whether this is recent input or older input from north Africans (if it is not just noise). Ethiopians haven't gotten their own cluster at K=7, and as i've said numerous times, East Africans are not the same as West Africans. Is the 0.5% Yoruba in Spaniards noise? I doubt it, as it is 0% in all other Europeans. whether this is recent input or older input from north Africans (if it is not just noise). North Africans get their own cluster (3rd one). What I meant to ask is if the west African element came to Spaniards via North Africans (who are mixed) or if it came directly during the slave trade. If it is the case that most Spaniards have 0 Yoruba and some have a little then I'd say that the former (slave trade) scenario is what happened. Someone recently made a post saying that was the case. In support of What he said I think it would be odd that Spaniards would be the only Europeans with any % w. African on the list unless it were very recent admixture. However I do see that the Spaniards do have many times the north African element than other Europeans suggesting somewhat recent admixture or low gene glow out of Iberia. Wish there were much more samples (both in terms of number of populations and number of individuals) available. I'm a newbie and I don't get how to read it. If it is the case that most Spaniards have 0 Yoruba and some have a little then I'd say that the former (slave trade) scenario is what happened. The maximum "Yoruba" in my Spanish sample is 1.3% with 5 out of 12 individuals showing some non-0 element. The analogy of components #3 and #5 in their ancestry is more akin to Mozabites and less akin to Moroccans and Egyptians, so I'd say that there is no reason to invoke separate "slave trade" explanations: Spaniards have a bit of Sub-Saharan because they have a larger bit of North African. 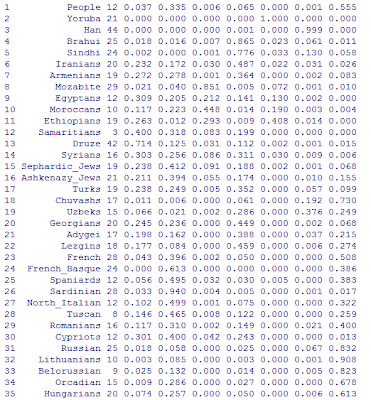 It's a list of populations with their admixture proportions. Each row is a population name, the number of individuals in that population and a list of K=7 numbers (all adding up to 1) representing the fraction of ancestry in that population from 7 inferred ancestral populations (columns). Why did you list the Italians with the Jews, Cypriots, and Samaritans? Showing your racism and ethnic prejudice, Marmie? The Sardinians are Italians too, and they lack the "Druze" component you placed in first spot. I don't necessarily agree with Dienekes about the Spaniards and their slight "Ethiopian" being due to those Moors. North Africans and Europeans, people from the Caucasus and the Middle East have been moving back and forth since the beginning of time. No need to invoke something just because it happened in historic times like the Muslim invasion of Europe. Galicia in Spain is supposed to have "North African" genetic signatories and was never occupied by Moors. The Moors are just a convenient excuse and a cop out. The next step is to integrate HapMap data with HGDP-CEPH and the Behar et al. dataset. What about Xing et al? Also it would be clearer if you displayed the average component distributions of the populations also in numbers as you did above. Xing et al used Affymetrix chips, so there is limited overlap of markers, plus the additional populations are not worth the bother at this point. I may still use what populations there arefor validation later on. I think Uyghurs and proper South Asian populations like South Indians (they exist in the Behar et al. dataset) would be valuable. There are already some Uyghurs in HGDP-CEPH. I know. The parenthesis was for South Indians. I may still use what populations there arefor validation later on. I wonder how Iraqi Kurds, Stalskoeans, Urkarahns, the Kyrgyz and Slovenians would appear. Dienekes, where can we download the SNP data for Behar and Xing? "Why did you list the Italians with the Jews, Cypriots, and Samaritans? Showing your racism and ethnic prejudice, Marnie?" 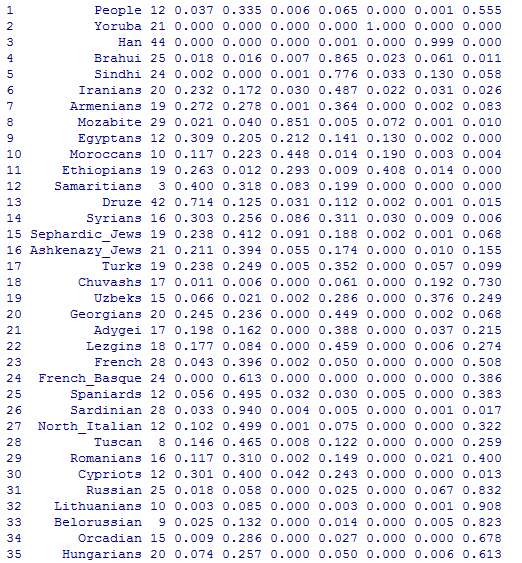 Ponto, the last posted table lists the Mediterranean groups that exhibit the "Sardinian" component in the 0.3 to 0.5 range, and also a Druze component. You're welcome to add Sardinians and Druze to my little table. I didn't because the Sardinians don't have much of a Druze component and the Druze show the Sardinian component at only 12%. Ponto, I'm sorry that you have some sort of chip on your shoulder about me, but it's baseless. If you don't like my table, put up your own. Dienekes, I would ask that you moderate your site a little bit on this front. Ponto's accusation of racism and ethnic prejudice is out of line. He should be called on it. For the Xing data the url is listed in my posts on the subject; for Behar et al. the link can be found in the paper's PubMed entry. Mainly I want to say please keep this up Dienekes! At some point I would love to see some new reflections on how we should interpret these styles of analyses. For example, when a population ends up being dominated by one component, I guess the way people end up describing things is that this population is genetically like an ancient population that literally moved to the other places. But that's not quite necessarily true is it? For example could they in some cases simply be relative isolates who are therefore by definition near "triangulation points"? These types of analyses are becoming common and I think a lot of people are misunderstanding them. So would love to see such things discussed more. The problem with this admixture analysis is that they do not show how related the population are. For exemple, regarding Spaniards having little "african" admixture, we could think that they are "less" europeans than South Italians, for exemple. There are no "less" or "more" Europeans (and the same applies to every other continent), as continents are not populations but they are the territories where different populations live. A Spaniard, an Italian, and a Finn are equally European by virtue of inhabiting the European continent, and a Berber, an Egyptian, and a Bantu are equally African by virtue of inhabiting the African continent. One can speak of someone being "more" or "less" made up of particular ancestral components. Someone who is made up of 50% Spanish and 50% Yoruba is less akin (genetically) to the Spanish population than one who is 100% Russian, but the former is "more Spanish" than the latter. For example, when a population ends up being dominated by one component, I guess the way people end up describing things is that this population is genetically like an ancient population that literally moved to the other places. But that's not quite necessarily true is it? Components do not come with ages. A population (or a set thereof) can be very ancient or very recent, and form its own cluster. Also, if a population forms its own cluster at some K, it does not mean that it is unmixed, as a mixed population will develop its own genetic distinctiveness after several generations of endogamy. Similarly, a population that appears "mixed" at some K may be distinctive, but its distinctiveness remains to be discovered at a higher K.
What we _can_ say is that when a population A has some % of a genetic component X and another one B has 0% that A did not contribute genes to B. Note however, that A's ancestors (prior to the formation of X as a distinctive component) may have contributed ancestors to B. That is incorrect if you are speaking about a 2D map, as individuals are represented by only two free variables, whereas a K admixture analysis represents individuals by K-1 free variables and is always more informative. The utility of the maps you refer to is that they often correlate with geography; however, individuals with VERY different ancestral components may fall on the same spot on the low-res 2-D map than they would fall in the K-D space of admixture proportions. While assuming the light Green component in Behar's study as the most suitable one to be an "indo-european" marker, the Anatolian (and also the Central Asian one at a lesser extent) hypothesis for the indo-european "urheimat" was the most propable. and thus a very old theory about Baltic region being the indo-european "urheimat" could be possible?? "However if we look at a PCA map of western-eurasians populations, even with their little "african" component, spaniards cluster with other Central/north europeans while south Italians , who have less african, cluster with jews and Cypriots..."
Apparently Dienekes doesn't feel that an unfounded accusation of racism should be moderated. The simulations were very interesting, but the presentation of the data is confusing. I'd like to suggest some improvements, but somehow have lost interest. Light blue hasn't split between Semites and non-Semitic populations yet as it eventually did in Behar's study. Also, we don't have data on the critical region of the Balkans. I may actually do some recruiting later on to get some additional data. Also Buryats, Pakis and Indians. BTW, the Japanese from Behar et al. would also be a good addition, especially since they are apparently purer Mongoloids than the Han Chinese in their average and, like the Han Chinese, they are from one of the largest populations of East Asia and thus similarly representative of East Asia (at least the central part). The Pashtuns (=Pathans) of HGDP-CEPH would also be a good addition, but not the Kalash (because of drifts). And lastly, the Khmer from HGDP-CEPH would be good representatives of the heart of SE Asia. Structure says: "So a PCA/MDS map is often much more informative than all these admixture analysis." Dienekes replies: "That is incorrect if you are speaking about a 2D map, as individuals are represented by only two free variables, whereas a K admixture analysis represents individuals by K-1 free variables and is always more informative. The utility of the maps you refer to is that they often correlate with geography; however, individuals with VERY different ancestral components may fall on the same spot on the low-res 2-D map than they would fall in the K-D space of admixture proportions." I say: "A simple Fst distance value tells a lot more about the true genetic relationships of populations than all these things you mention, no matter how detailed they are." Fst between populations masks the distribution of admixture in individuals. We wouldn't know anything about the wide distribution of admixture proportions in Mexicans, for example, if we relied on their Fst to Europeans and Amerindians. Also, it is by the study of ancestral components that we came to realize that Indians have a "native" and a "Central Asian" component, something which would've been unknown to us if we had relied on Fst. Finally, Fst, especially when dealing with dozens of populations is hard to interpret, which is why people feed it to MDS or tree-building algorithm to give it a form amenable to human understanding. "Finally, Fst, especially when dealing with dozens of populations is hard to interpret, which is why people feed it to MDS or tree-building algorithm to give it a form amenable to human understanding." Right now, you're plots are not particularly amenable to human understanding. 1. Make multiple plots for each "component", with the populations sorted in order according to the "component", from left to right. Here, you'd have red, dark blue, light blue, dark green, light green, pink, etc. plots. The minor components would still be on the plot, but the sorting would be on a specific component in each graph. 2. Plot the populations in geographic order, east to west, north to south, as appropriate. Only the plots in which population boundaries aren't clear, as the first plot on this thread. I'm a little puzzled how the Indian sub-continent orange fits into Europe, as even the Russians have less of it than the French. "Yes, but WATCH OUT!, because you can be called a "racist" and ethnically prejudicial for merely trying to organize the data to show the Italian-Cypriot-Jewish relationship. (It seems to be the Tuscan-Jewish connection, but never mind, it's racists to talk about it.)" Have you ever seen north italians or tuscans cluster with jews or Cypriots? Then there is a similar matter with spaniards but with africans this time. Or you are interested in italians only? There are not significance around the samples in the plot. I mailed Dra. Behar few month ago this year, and she belief like me that Jews populations are more than haplotypes. There are history and culture evolving these Jews peaple that are not a race but a approaching human being to Judaism in the Galut way. How could you explain that Polish Jews bring inside more African componets -for example L2 mtDNA markers and others - than Sephardim? Here is not displaying. Ashkenazim likely have between 4% to 27 % East African -mainly- and in minor South Saharan source markers, even Y and mDNA signals like a genetic landscape of ME of ancient times. The ”L1” and "L2" mtDNA marker is present in the two populations – Ashkenazim and African Ethiopian Jews - also the derived and sibling mtDNA Hg "M" and "N1" from "L3", as well as the Y markers Hg E3b and 4s too, all of this from East Africa and so. (Also is watching in autosomal markers in few minor as well) They belong respectively at one of the three nucleous or center jewish ancient populations, that evolving the called "Syrian-European nucleous"(helenistic and Roman times-of profusus and lavish proselitism with genetic inlays-). See: when in other papers like this too, for example, Polish Jews mtDNA L1,L2 close to 4% Polish non Jews are 0% ; also see tables about mtDNA "L2" and "N1" - "G" ME and EA variant - or "M" markers in Behar et al. papers. "a Berber, an Egyptian, and a Bantu are equally African by virtue of inhabiting the African continent". Yes, but in this case that is purely a european convention. I dont think that most Berbers or Egyptians will describe themselves as "africans". A Berber will probably see himself as "Mediterranean" and an Egyptian as "Arab"... By the way for anthropologists, North Africa like Anatolia were part of Europe. Which ones did you download? Racism exists in lots of forms, some most people don't even think of as racism. I often wonder why people always choose the Northern Europeans as some sort of exemplar of being European. Who appointed them in that role, and what is their proof of being made the exemplar of European. Most of North Europe only became habitable in the Holocene, 10,000 years ago after being under some tonnes of ice. That means all the people in Northern Europe, most of Britain, Ireland are descended from people who entered those parts 10,000 or less years ago. Southern Europe has been inhabited continuous for 40,000 years. Now the question is, where the hell did those "Europeans" come from? Obviously not from Europe. It would be better to label the Sardinians as European as they are the only ones in Europe who appear to be of autochthonous European origins. Yes I call that racism. Dieneke, why did you remove Orcadians? Are they genetically marginal for NW Europe and thus not representative of there? I think inclusion of the South Indians of Behar et al. and the Khmer of HGDP-CEPH would greatly contribute to the general results. "I often wonder why people always choose the Northern Europeans as some sort of exemplar of being European." Please work out your issues with this somewhere else, rather than randomly targeting me. My efforts in putting up those tables where to try to organize the data in a more readable and interpretable format. In the above cases, east to west (Danube), north to south (Middle East), east to west (Middle East) and east to west (Mediterranean). Unfortunately, Blogger doesn't allow for graphing. You can look at the plot that "Structure" posted the link for, which clearly illustrates the close relationship between Tuscans, Jews and Cypriots. Sardinians are clearly outside the cluster. BTW, I don't regard the Mediterranean as being *not* European, so please find someone else on whom to work out your issues. The "Sardinian" component is reflective of something "much broader." Yeah. So broad that it's interesting to look at who *doesn't* have it, especially in areas that are adjacent to populations who do. It would be better to label the Sardinians as European as they are the only ones in Europe who appear to be of autochthonous European origins. Sardinians and also Basques are by no means representatives of Europeanness as they are pretty much drifted and homogenized populations (because of long isolation). In fact, I wouldn't include Sardinians and Basques in a worldwide genetic analysis (like this one), as they distort the results because of these reasons. "I often wonder why people always choose the Northern Europeans as some sort of exemplar of being European. Who appointed them in that role, and what is their proof of being made the exemplar of European." The old school race scientists and the Nazis did this. The basic idea relies on the idea that the "pure" European is very light skinned, fair haired and fair eyed and that dark hair or dark eyecolor in Europeans must be the result of non-European admixture. This led to the idea that southern Europeans are admixed with middle easterners and Africans, while northern Europeans remained "pure". With the idea that Scandinacia must harbour the purest Europeans of all. In fact, I wouldn't include Sardinians and Basques in a worldwide genetic analysis (like this one), as they distort the results because of these reasons. They distort the results by causing other Europeans (=proper Europeans) to appear genetically less European than they really are. Structurally Italians don't belong in that group. They belong with the other Europeans, primarily southern. The grouping is as if Italians are "tainted" Europeans so they are no longer Europeans. That kind of thinking fits in line with racism. But that could just be theoretical and might not reflect real world thinking; ie emphasis in "impurities". I do however find a clear sexist bias when she comments on gender studies. Get the series matrix files in the first link you sent me. The whole point of scientific analysis is that it finally gets to the truth. If we want to eradicate "racism" from our discussions, the way to do it is to keep discussing. If you disagree with someone,say it and argue your corner. If your argument is flawed then others will point it out and give reasons. So stop bleating and start arguing. As we say in this corner of North Europe "facts are chiels that winna ding!" "You can look at the plot that "Structure" posted the link for, which clearly illustrates the close relationship between Tuscans, Jews and Cypriots. Sardinians are clearly outside the cluster." Are you blind, biased or what Marnie? Where the hell do you see tuscans cluster with Jews and Cypriots? They are almost as distant as sardinians are and they are in the north italian plot. You better start to learn at least the definitions. I start to think that Ponto is right with you. You are so biased that you can't never read or interpret well. "There are many autosomal sutdies in which Spaniards do not show more African admizture than other southern europeans. For example in the study of Behar et al. Spanairds do not have more SS African than other south-europeans. Anyways, Spaniards cluster with Western Europeans (French, North Italians,etc) while Southern Italians and Greeks are closer to Jews, Cypriots and Levantines"
Spaniards sligthly touch french in some maps, but they don't cluster with any north europeans at all. Moreover in some 23andme results the spaniards show both north african and levantine much more than other s.Europeans. I think that if there was a map with separated regions of Spain we would have some surprises, and not always good for spaniards. There are not significance and validity around the samples in the plot. I mailed Dra. Behar few month ago this year, and she belief like me that Jews populations are more than haplotypes. There are history and culture evolving these Jews people that are not a race but a approaching human being to Judaism in the Galut way. How could you explain that Polish Jews bring inside more African componets -for example L2 mtDNA markers and others - than Sephardim? Here is not displaying. Ashkenazim likely have between 4% to 27 % East African -mainly- and in minor South Saharan source markers, even Y and mtDNA signals like a genetic landscape of ME of ancient times, these markers were acquired since the first Temple VI BC destruction until the II century A.E. –Bar Kochba period in Roman Judea- as well in the Muslim invaders take place at VII AE in the Alexandria Egypt Jewish Center mainly too. The ”L1” and "L2" mtDNA marker is present in the two populations – Ashkenazim and African Ethiopian Jews - also the derived and sibling mtDNA Hg "M" and "N1" – G nucleotide variant from M.East. or E. Africa.- from "L3", as well as the Y markers Hg E3b and 4s too, all of this from East Africa at more ancient times –Solomon period- and so. (Also is watching in autosomal markers in few minor as well). They belong respectively at one of the three nucleous or center Jewish ancient populations, that evolving the called "Syrian-European nucleous" (Hellenistic and Roman times-of profuse and lavish proselytism with genetic inlays-). The Ashkenazim also have likely between 35% to 55% Europeans components, a half from South Europe acquired in ancient times, while the named “Hellenistic Proselytism” in Greek, Anatolia and Rome including Women and Men, The other half was shared and inlaying with East Europe and host populations along the Galut or Diaspora life. This other middle part was mainly from converted women and it could be see in the mtDNA almost exclusivist. The Ashkenazim also have likely between 20% to 35% of West Asia markers that represents the time when Ashkenazim were living in East Europe and the contact with Turkish Jews Khazars and the inbred into religious restrictions in Middle Ages, and Modern Era, that was the norm, modifying the profile patterns from a “Coptic” - “European Syrian” Jewish ancient mix returning in part to a more South East European Syrian like. The Ashkenazim also are Jews People, with M.E. markers more than 65% of the “Y”, mtDNA, and Autosomal markers as well, in shaken Lands of ancient Israel and Judea with all the haplotypes coming from the three Continents around and also with the believe -like all Jews- about the return to your promise Land. They are too like others ancient Jews population, a group 100% of Jewish tradition, but not ancient more beyond 1200 years. Thanks a lot for these your very very interesting works and studies. Alfio is right, Tuscans do not cluster with Jews and Cypriots on the MDS plot. Those Italians who cluster with Jews and Cypriots on the MDS plot are all from unidenitified provenances. But given the fact that none of the identified North Italians and Tuscans cluster with Jews and Cypriots on the MDS plot, all of the unidentified Italians on the MDS plot are probably South Italians. This is in line with previous genetic research indicating close genetic relationship between South Italians and East Mediterranean populations and also in line with history. But I am not saying all South Italians should cluster with East Mediterraneans on MDS plots, they have variety in their East Mediterranean genetic affinities. As to Sardinians, given the fact that they are closest to Tuscans on the MDS plot, they are probably a population with predominantly Central Italian origins that later genetically diverged from all other populations due to long isolation and drifts, so they in no way represent Italianness. If Dienekes included South Indians, the Dravidoid blood (the dark green component at higher Ks in Behar et al.) in Pakistani/Afghanistani populations and Iranians (probably also in Central Asian Turkics) would be clear. As previously said, if Spain was studied region by region the results would be different. I apologize with Dienekes for my off topic but i wanted to clear some mystifications. Artu', on that plot Europeans appear too close to each other because of the inclusion of populations from every corner of Earth (most of them aren't visible in your link, since your link contains only the West Eurasian part of that plot). In 23andme many spaniards are different from french and above all they don't cluster at all with swiss people. Anyway the map i posted doesn't concern only some admixture "parts", and it explain many of the levantine and n.africans results i have seen in many spaniards results at 23andme. Artu the Spaniards have very low middle-eastern input, less than all of southern europeans and some Eastern Europeans. As for 23andMe, all the spaniards I have seen are in the Northern European box clustering with French, Austrians and even Germans. "Artu that's not true. Overall spaniards are overlapped with French people and Swiss, as seen in many other autosomal studies. However north Italians overlap with spaniards and slightly with French. The map that you posted only takes into account some admixture parts, not the overall admixture. This is the overall map from the same study:"
The Spanish do not cluster with the Swiss. Most or the Swiss cluster with or are near the Germans, Belgians, and French. Alot of studies have misrepresented the Swiss, making them appear more southwestern than they really are, because the studies used people of Geneva to represent Switzerland. That one study in 08 specifically looked at the genetic differentiation in Switzerland as related to the three main languages (which is related to geography). The German Swiss, forming the majority of native Swiss (abt. 70%), are plotted to the northeast of the French Swiss on the genetic map. The people of Geneva are French Swiss and are located at the extreme western part of Switzerland. So the Genevans are to the far southwest of the Swiss population on genetic maps and have misrepresented Swiss as being closer to the Spanish. I wish there were more genetic studies in the Swiss as a whole. I don't have a very clear picture of where they belong. I would generally define them as central European. Id also say the German Swiss are closest to the southwest Germans too.